Mall photo Scavenger hunts and traditional mall riddle scavenger hunts are great fun. Scavenger hunts are a good way for kids to have fun in a reasonable safe environment. Whether a traditional mall scavenger hunt with riddle clues and a time limit, or an exciting mall photo scavenger hunt clue list of crazy challenges, most will remember their experience for a long time after. The buzz and feeling of competition is just hard to beat. The weather doesn’t affect your day either, adults can join the fun too, and the mall really is an incredible location for a day out of the house. Get some ideas below the clues. Have you ever participated in a scavenger hunt at the mall? What about any type of scavenger hunt? As a child, they might be one of the more fun things you can do to keep active while having fun at the same time. Some scavenger hunts can be setup for adults, but for the most part, they are geared towards children. Setting up a scavenger hunt at the local mall is not that hard and with our scavenger hunt clue packs, the process has become even easier. Scavenger hunts are a great way to allow children to have fun in a controlled environment and even helps them socially as they are likely to be interacting with friends or family during the events. That is dependent on how you set the hunt up and sense they are all customizable, the possibilities are endless. If you live in an area where there are a couple of different malls, or just one large one, a scavenger hunt might be a great idea for a birthday event or just something to keep the kids busy for the day when you want to get them out of the house. Think about ways that you can incorporate the mall into your scavenger hunt. If you are having trouble coming up with ideas that work, you should know that our clue packs are designed with the mall in mind, as well as the perfect ingredients for fun. Most malls are indoors and that is the best part when it comes to trying to plan around the weather. Rain outside still means that you can setup shop inside the mall and have your scavenger hunt without any delays from poor weather. This also makes it a great way to have fun with the family during the long winter months in some areas of the country. The mall photo challenge scavenger hunt clue pack will provide you with a list of challenges that can be completed for points. Arrange the points so that more are collected for the tougher clues and that way a player can get a good amount of points even if they did not complete all of the clues before the allotted time-frame. The clue packs are designed with the idea that you would cut them apart, so there is plenty of space built into them to allow for that. You can then either hand the clues out or have the players draw them from a hat. If you chose to go with the Mall Riddle Scavenger Hunt clue pack then you will be getting a list of clues that will guide players to certain objects. Once they find them they can earn points or maybe you could set them up with a special treat from the food court for playing along. The best way to use our clue packs once you have them purchased is to sit down and plan the scavenger hunt. It makes things easier if this is done ahead of time and doesn’t take away from all the family fun that you are about to have. 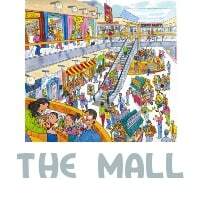 Plan what mall you want to go to and maybe think about the best time that you could go so that there are not a lot of people there that can get in the way or that might be bothered by the scavenger hunt. If you are not there to shop, those that are will have the right of way before you, so make sure that you keep that in mind. If your mall has a lot of different stores, maybe you could incorporate them into the scavenger hunt allowing the players to purchase something at one store if they get the most points. There are so many ways to customize the clue packs for the mall scavenger hunt, the possibilities are endless and only limited by your creativity. Thanks for supporting our site and if you are interested in larger clue bundles, we have them available at a 50% discounted rate if you purchase them all at one time. More photo scavenger hunt clues for children are on our home page.